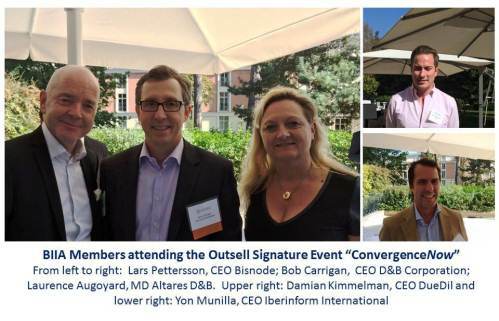 BIIA extends its compliments to Anthea Stratigos, CEO and Co-founder of Outsell, and her team for producing an outstanding industry event “ConvergenceNOW!” The event, which was co-produced with the Jordan, Edmiston Group, Inc. (JEGI), took place in the historic town of Versailles outside Paris. Over twenty presenters covered a wide range of key topics on the convergence of content, technology, software, devices, people and workflow, which has become a US$ 738 billion industry. The opening keynote address was given by Benjamin Ware Starnes, M.D., F.A.C.S. ; Professor of Surgery & Chief of the Vascular Surgery Division of the University of Washington. At first glance it appeared that Anthea Stratigos had thought about our health and keeping fit; but far from it. In a riveting presentation the audience learned all about the interplay of human skills, intuition, software, hardware and 3D printing to repair ruptured aorta arteries and saving lives. Another rather timely presentation was given by Richard Bejtlich, Chief Security Strategist at FireEye, Inc. about Cyber Security. He told the audience all about what hackers can do to us and what we should be doing about it. There was also the highly interesting key note address by the new CEO of the Dun & Bradstreet Corporation, Bob Carrigan. The theme of his keynote was “A View from the Top”; a brilliant delivery of his challenging task of creating sustainable growth for D&B. That is all what we can tell you about the event, because conference topics and presentations were off the record. Several members of BIIA took the opportunity to learn all about the hot topics of working in the US$ 738 billion information industry. The next Outsell Signature Event will take place in Singapore on March 18/19th, 2015. The event will be co-produced by BIIA. Keep the date!